I attended Luther Burbank High School in Sacramento. During this time I had the opportunity to travel extensively throughout California and the United States performing with the Sacramento Youth Band and the Northern California Demolay Show Band. I earned a music scholarship that provided for my attendance at the University of Nevada-Reno from which I graduated in 1970 with a Bachelor of Science Degree in Music Education. In 1971, following a short period of student teaching at Reno High School, I was awarded a scholarship to the Berklee School of Music in Boston, Massachusetts. It was there that I studied with Herb Palmeroy and the world renowned Carmine Carusso. Based on my extensive experience in music education and performance, I have been involved with the nationally acclaimed Reno Jazz Festival since 1965 and served as an adjudicator since 1986. 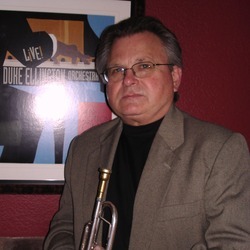 A professional, freelance musician for over 40 years, I am currently a member of The California Musical Theatre Orchestra, performing Broadway Shows at the Sacramento Community Center and Music Circus. In addition, I am currently a member of the Curved Aire Brass, helping to bring a high level of professional and artistic performance to the community, thus creating role models for thousands of young band musicians, educators and music connoisseurs. Over the course of my 40 years of professional performing & teaching,  I've given private trumpet lessons to students of all ages, from beginning to professional levels and continue to have a large student client base. Dionne Warwick, Frank Sinatra, The Smothers Brothers, Sarah Vaughn & countless others.